Well, basically it's possible to build almost every dimension you want with a 3-piece wheel. But: 1. I'm not the one to do it, because I'm not the one to make the replicas. 2. "stock fenders" and "fit" are much more unambiguous terms than one might think. How far do you want to push it to the edge? Is there still all original metal on your car and did it never have any accident? Do you cruise around only or do you push sometimes with hard cornering and simultaneous hard braking? Many people claiming to have absolutely no rub with relatively big wheels never do with an 02, what can be done with an 02. 3. What's the tyre size that you do have in mind, when you're sure you wanna go 14? Best regards, Lars. For the Alpina 3-piece race wheels there were small centers available resulting in 13' flat bed (or 14/15 with bigger rim halves). And there were bigger centers available resulting in 15' flat bed (or 16/17 but those mostly with 5x120 pattern for the Coupes). Both available as replicas,but definitely not cheap. Best regards, Lars. But Mark, you're not gonna get out much better with the 13s with 185/70. Not to speak of 195 or 205. For german street use for both 6 and 6,5 the wheel papers require "ausreichende Radabdeckung" which means fender flares or serious metal work for 02. Only 5,5 Alpina are allowed without it (and even those do actually rub with some 185/70 on some cars). Best regards, Lars. Engine and Drivetrain How many of you are running 91mm Pistons or larger? Problems are in the middle. At least to some point. Best regards, Lars. Stitching isn't necessarily lost depending on how you do the work. Didn't find a satisfying and reasonably priced solution for the chrome strips yet, though. Best regards, Lars. Nope. At least I've never ever before seen it done like you did. For turbos in the rear one cuts and whelds about the same as for boxes or cheeks normally, just as Toby said. Except maybe of some late and very big boxes for race cars. Best regards, Lars. Additionally to the sedan two-piece rocker (inner/outer) the factory convertible has a third part in between. On the inside of the A-pillars there is a reinforcing box section (one-piece from factory / lower end seam on the photo because of partly rust repair). Floor section below the seats has extra metal reaching from inner rocker to tunnel. And as to be seen in the lower right edge the front support for the lower backseat is a squared profile. Compartment for the convertible top may ad a little strength, too, but more important is the boxed section between the top of the rear wheel arches. That's about it besides the front windshield frame containing a quite stable flat iron (its lower end peeks out still unattached in this photo). Antenna on A-pillar originally not allowed from factory as you better shouldn't drill holes or totally cut through in the enforcing flat iron - ignored by pre-owner, though. If radio option ordered from factory, antenna sits on trunk lid (and is f...g expensive if you search for an original one today). For the Baur targa I can't tell anything specific as I've never owned one or repaired one body-wise. Best regards, Lars. 1972-1974 E12 520i had same M15 engine as a tii? Yes Steve, AFAIK that's exactly the way it is. Once the older stocks were used up, you also got the E21-type when you had to order an original replacement engine at BMW for your differently delivered NK, early 02 and early E12. Best regards, Lars. I totally agree on Carl's big, big WOW! Awesome! Bucket is Recaro. Can't find the pictures right now but I redid one of those about two years ago for a friend. Friend's car is an Alpina A3 converted from new and bought by his father when one year old. All paperwork still present and driver seat named as "Schalensitz Recaro" in the original receipt. Here it is in an old Recaro sales brochure on the upper left: Best regards, Lars. Euro E21 320i M10 started in 1975 and came with Bosch injection only. Injectors for Bosch are different. Euro E12 520i M10 started in 1972 and first came with K-Fish. In 75 or maybe early 76 (don't 100% remember right out of my head now) it was switched to the Bosch system of the E21 (at about the time when the production of the Euro 2002tii ended). So the early 520i shared the same injectors with the 2002tii. By the way the start of the E12 with its - compared e.g. to its predecessor NK 2000tii - slightly revised engine was the reason why in 02s from about that time also the "E12" cylinder heads were used instead of the earlier "121" ones. M1 came with six-cylinder K-Fish and so in principle also shared these injectors. I thought I've once been told that they came with a bigger opening pressure on the M1, but I'm not sure anymore and in no way an M1 expert. Water pump on Euro E12 520i M10 is different than the one in 2002tii. It's "longer/deeper" and will hit the radiator if you'll try to put it in a 02tii. Best regards, Lars. $10K for the cats meow of Tii injector pumps! On the 2002turbo BMW delivered bigger valves on a production car themselves inside a ballfish. VGS is working on 4-cylinder pumps, too. Met Reiner Ahrend on weekend and he told us so. Best regards, Lars. 😁😁😁 And the sahara would be a convertible with a very special body kit and a rear-end Volkswagen boxer. Seats from a 1970 2002TI in chamonix that I did. Vinyl and cloth available at BMW as very good reproductions. Early second owner 2000touring I did the Scheels for. Definitely still original carpet. Sorrowly didn't take detail photos as not clearly visible on the ones I have, but the "pepper" parts of the carpet were clearly dark blue and not black/dark greyish. Have never really recognized that before (didn't pay too much attention either as I personally prefer the velours carpets of the special late EURO Lux models and have put that in each of my cars regardless of originality) but as my job included also mounting the seats in the car, I was so-to-say forced to get my nose down there. Not sure if already available in the pre-71 cars and didn't find enough cars with demonstrably still original carpets to really cross-check, though. Best regards, Lars. 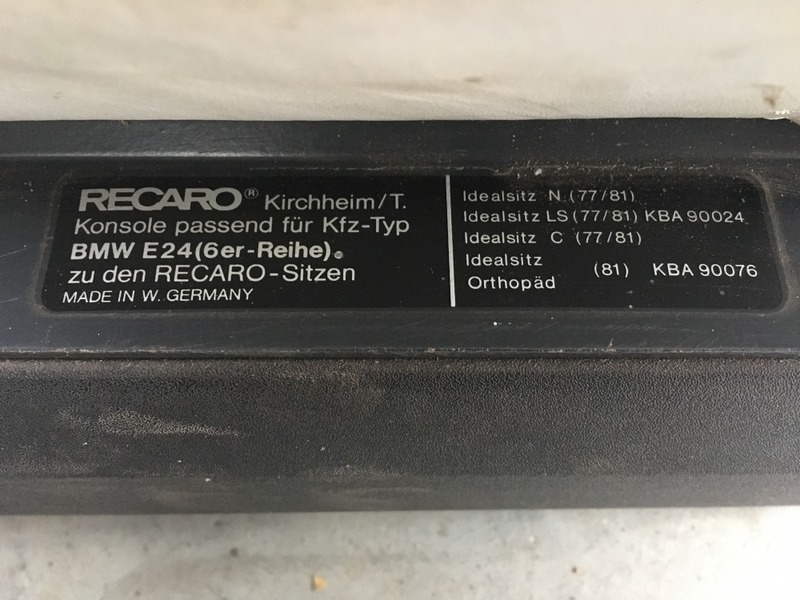 Anybody knows according to the typeshield on the frame of these e24 recaro seats what the original composition of these seats was( Color of leather or fabric)? What do those codes mean on the typeshield? @LarsAlpina do you offer refurbishement or reupholstering of those seats? the typeshield doesn't tell anything about colors or cover materials. This is a special german thing as for cars for street use sport seats are only allowed with using the approved model-specific mounting brackets or adapters. Just says that your brackets are for use in E24 together with the Recaro types on the right. Great faq and helpful people as I can read. i recently bought recaro seats for my 1983 e24. Does anybody have any info on these seats according to the type designation on the frame? What does those designations mean? I think this was not the original leather, but which was it? @LarsAlpina do you refurbish (reupholster) seats? Seats look to me like they still carry the original leather covers from some details. Just seems to be quite dirty and a bit worn out. I do reupholster seats but would you be so kind and contact me via PM, please. Thank you.